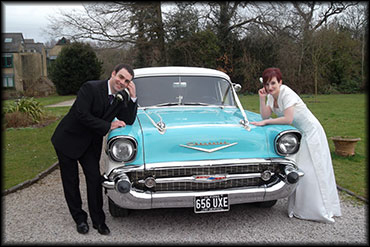 Hollywood limos is a very successful Devon wedding car company having successfully completed over 5,000 events and going from strength to strength. The amazing, 8 seater, Chevy is a really relaxing and fun way to travel to your service. We often take all the bridesmaids with the bride to the service so by the time they arrive they are really relaxed, laughing and giggling at the experience and ready for the big day. This is a favourite as a surprise for most people but especially for a nostalgic memory of the 1950’s for older folks as a memory jogger. When the car arrives the surprised look on their faces is amazing with a grin from ear to ear. It certainly gives it the wow factor when you open the door and see the iconic Wurlitzer juke box and the polka dot interior. so put on some tunes and cruise. We even serve drinks on a coca cola tray, how cool is that?! 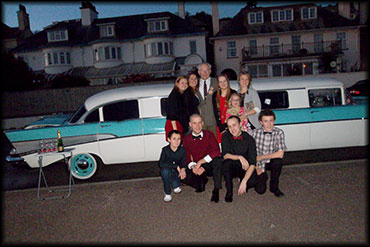 School Prom transport, old school limo Devon. Whether you’re a student looking for a prom car, or a parent trying to find the perfect chauffeur-driven vehicle hire for your daughter and her friends, we are able to offer useful advice to help you make the right decision. We started our business in Canada with school proms then transferred all our expertise to this country. Our chauffeur-driven cars are high-quality and immaculately maintained, boasting a range of features such as state of the art entertainment systems, CD/DVD players and much more. We offer a range of chauffeur-driven vehicle hire including stretch limos, 1950’s American cars, sports cars and much more. 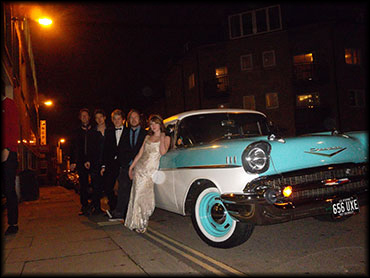 Students love to arrive in something totally different to their school prom and make a statement. The 1957 Chevy does this and a lot more. When you book a chauffeur-driven prom car hire with Hollywood limos, you can be guaranteed a five star treatment right from our helpful customer service advisors to our friendly and knowledgeable chauffeurs. 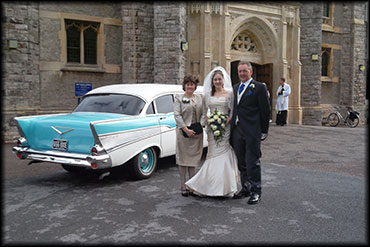 We are a south west service, based in Exeter catering for Cornwall, Devon, Dorset and Somerset. 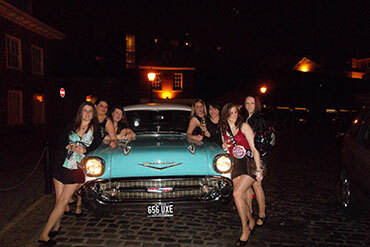 It doesn’t matter where you’re located; your chauffeur-driven prom car hire will pick you and your friends up from your doorstep and transport you to your school prom in luxury and safety. We are CRB checked and have done over 5,000 events. Hollywood awards nights complete with look alike of Marilyn Munroe with red carpets. Children’s/adults 1950’s parties to a drive in. Back drop for photo sessions. The fabulous fins and lots of chrome are very iconic of the 1950’s look. Promoting several 1950’s drive-ins, where all the staff where wearing period clothes. We have transported Michael Jackson and family members on several occasions. We are keen to take on a national company for advertising similar to Sheilas Wheels branding.